The Flavel Raglan is a traditional balanced flue gas fire with a heat output of 2.8kW and a net efficiency of 80% The Raglan is ideal for those who do not have a chimney but want to install the fire onto an exterior wall. The traditional design of the Raglan allows it to be fitted with any traditional fireplace. The Flavel Raglan BF gas fire comes with everything needed to fit the fire, pipes to go through the wall, terminal for the outside wall etc. Please see the installation guide on the product page "Downloads" tab for full list of parts included. 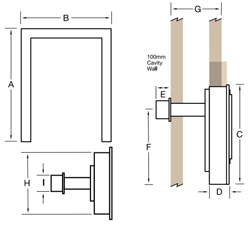 Installation guide and user instructions for the Flavel Raglan balanced flue gas fire.